Those of you who follow me on Twitter know that I have a bit of a problem when it comes to Peak Picks. Peak Picks is a new-ish program of the Seattle Public Library. They take several copies of the hottest new books and stash them at random libraries all over town. You can look online and see where they are, but YOU CANNOT PUT THEM ON HOLD. Moreover, you CANNOT RENEW THEM. They are 2-week check outs only. This beautiful, terrible program turns bookworms into addicts. A friend of mine drove across town twice to get a copy of Celeste Ng's Little Fires Everywhere only to find it was gone by the time she arrived. So when I was in the Central Library 2 weeks ago and saw Educated, I knew it was now or maybe never. I grabbed it, hoping I could finish it and my other library books before the two weeks were up. It was no problem. This book is phenomenal. It's everything you want from a memoir: Westover doesn't hold back. She doesn't sugarcoat her past. She reaches back through the past and channels the feelings of being a girl trapped in an abusive, fundamentalist home. She translates the indescribable feelings of a mental breakdown into something lucid and understandable. Her story itself, that of a Mormon fundamentalist girl who was never allowed to go to school and somehow managed to earn a PhD from Cambridge, is astonishing, but it's how she tells it that really sets it apart. Westover's most difficult feat is perhaps how she portrays a family in denial. Denial is a funny place to be, because when you're in it, you never realize it. To the reader, as to an outsider, Westover's father is clearly mentally ill. But Westover illustrates how she could be raised under this man's thumb and never be sure that anything was wrong. That's the nature of denial: you'd sooner question your own sanity than the words of your abuser. This is what so many people get wrong about abuse and manipulation. They scold people who stay in relationships with abusers or addicts, never realizing how that ecosystem looks completely different to those inside it. Everything I had worked for, all my years of study, had been to purchase for myself this one privilege: to see and experience more truths than those given to me by my father and to use those truths to construct my own mind. I think a lot of us coming out of Evangelicalism can relate. What are you reading? 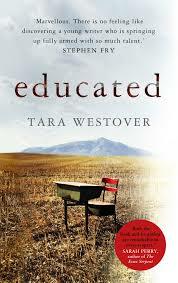 Have you read Educated yet? Why not?